F# is Microsoft’s purely functional programming language, that can be used along with the .NET Core framework. In this article, we will get introduced to F# to leverage .NET Core for our application development. This article is extracted from the book, .NET Core 2.0 By Example, written by Rishabh Verma and Neha Shrivastava. 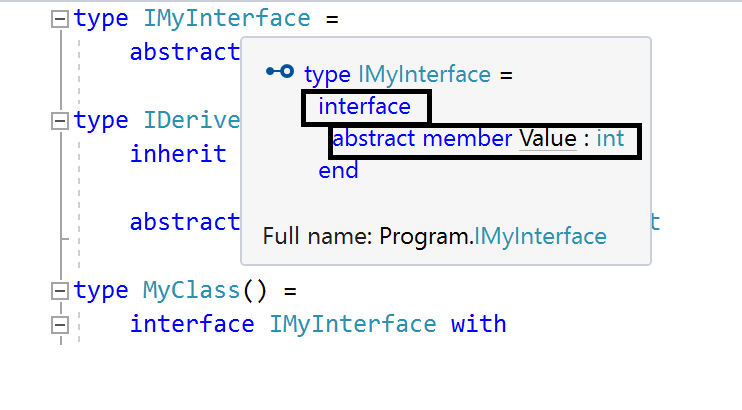 type: In the F# language, class definition starts with a type keyword. access-modifier: The F# language supports three access modifiers—public, private, and internal. By default, it considers the public modifier if no other access modifier is provided. The Protected keyword is not used in the F# language, and the reason is that it will become object oriented rather than functional programming. For example, F# usually calls a member using a lambda expression and if we make a member type protected and call an object of a different instance, it will not work. type-name: It is any of the previously mentioned valid identifiers; the default access modifier is public. type-params: It defines optional generic type parameters. parameter-list: It defines constructor parameters; the default access modifier for the primary constructor is public. identifier: It is used with the optional as keyword, the as keyword gives a name to an instance variable which can be used in the type definition to refer to the instance of the type. Inherit: This keyword allows us to specify the base class for a class. let-bindings: This is used to declare fields or function values in the context of a class. member-list: The member-list comprises extra constructors, instance and static method declarations, abstract bindings, interface declarations, and event and property declarations. A let and do binding creates the primary constructor of a class and runs when an instance of a class is created. A function is compiled into a member if it has a let binding. If the let binding is a value which is not used in any function or member, then it is compiled into a local variable of a constructor; otherwise, it is compiled into a field of the class. The do expression executes the initialized code. As any extra constructors always call the primary constructor, let and do bindings always execute, irrespective of which constructor is called. // Property that has both get and set defined. // Alternative syntax for a property that has get and set. Explicitly specify the value: We should use the explicit way to implement the property if it has non-trivial implementation. We should use a member keyword for the explicit property declaration. Automatically generate the value: We should use this when the property is just a simple wrapper for a value. Automatically implemented properties don’t work efficiently with some libraries, for example, Entity Framework. In these cases, we should use explicit properties. // Abstract property in abstract class. // A type with a "virtual" property. In a derived class, we can access all methods and members of the base class, but it should not be a private member. To refer to base class instances in the F# language, the base keyword is used. In the previous example, we declared a virtual method, virtualMethodExample, in a base class, MyClassExampleBase, and overrode it in a derived class, MyClassExampleDerived. Primitive types: bool, int, float, string values. In the preceding examples, we saw that tuple supports pattern matching. These are option types and an option type in F# supports the idea that the value may or not be present at runtime. This kind of type declaration is used when we have the same type of fields or field type declared in more than one type. This declaration is called a record expression. F# also supports implementation inheritance, the creation of object, and interface instances. In F#, constructed types are fully compatible .NET classes which support one or more constructors. We can implement a do block with code logic, which can run at the time of class instance creation. The constructed type supports inheritance for class hierarchy creation. The override keyword is used to override the base class implementation; to use the base class implementation of the same member, we use the base keyword. In F#, interfaces can be inherited from another interface. In a class, if we use the construct interface, we have to implement all the members in the interface in that class, as well. In general, it is not possible to use interface members from outside the class instance, unless we upcast the instance type to the required interface type. member x.HelloString() = sprintf "%s"
The exception keyword is used to create a custom exception in F#; these exceptions adhere to Microsoft best practices, such as constructors supplied, serialization support, and so on. The keyword raise is used to throw an exception. Apart from this, F# has some helper functions, such as failwith, which throws a failure exception at F# runtime, and invalidop, invalidarg, which throw the .NET Framework standard type invalid operation and invalid argument exception, respectively. We can see in the previous screenshot that the exception message doesn’t contain the message that we passed. 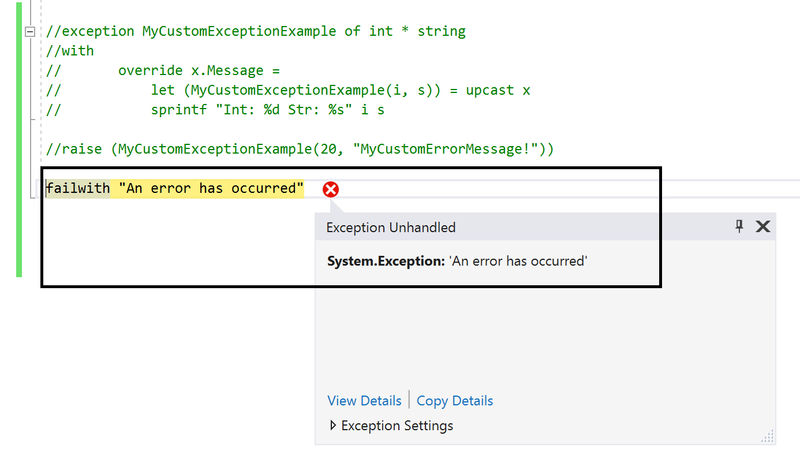 In order to display our custom error message, we need to override the standard message property on the exception type. We will use pattern matching assignment to get two values and up-cast the actual type, due to the internal representation of the exception object. failwith "An error has occurred"
By now, you should be pretty familiar with the F# programming language, to use in your application development, alongside C#. If you found this tutorial helpful and you’re interested in learning more, head over to this book .NET Core 2.0 By Example, by Rishabh Verma and Neha Shrivastava.